Exotic fruits are combined with refreshing mint in this colourful flavour-packed dessert. Place the sugar in a heavy-based saucepan with 200ml cold water. Bring to the boil then allow to simmer for 5 minutes until the sugar has dissolved and the liquid has reduced by half. Pour the syrup into a jug, add the lemon zest and half the mint. Allow to infuse for 1 hour then strain. 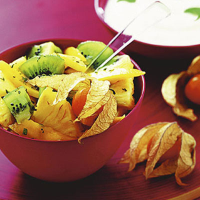 Cut the pineapple into small wedges and toss gently in a large bowl with the kiwi fruit and mango pieces. Pour the cooled syrup over and combine well. Divide the fruit between 4 bowls, decorate with the physalis, first peeling back the papery skin. Sprinkle with the remaining mint, finely chopped, and serve with natural yogurt. The syrup can be made in advance and will keep for 1 week in a sterilised screw-top jar in the fridge.